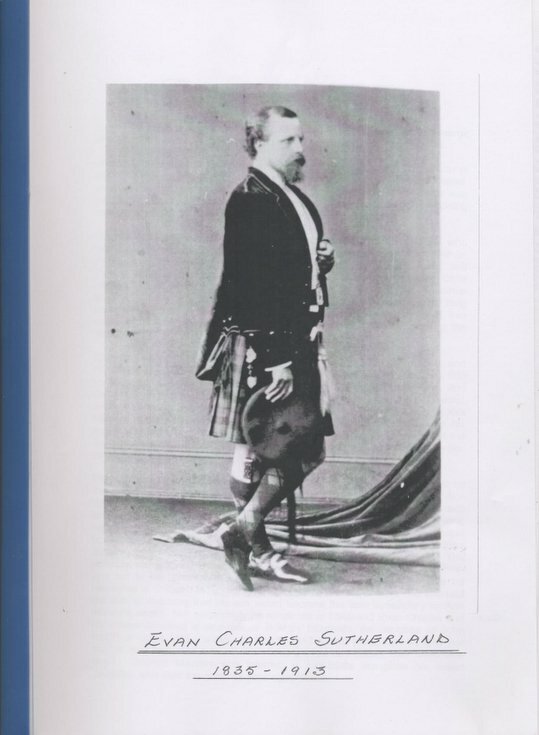 Bbooklet consisting of 21 A4 pages bound in clear plastic cover detailing the ancestry and life of Evan Charles Sutherland-Walker who purchased Skibo castle in 1872; contains family tree, photograph, and details of other properties. Photocopy of original. I am trying to put together a brief account of Evan's life, he lived for many years near here (Halifax, Yorkshire) and founded a local school. Living in Lightcliffe and having made a study of Crow Nest, the home of Evan Charles Sutherland Walker and his wife Alice Sophia Tudor Sutherland Walker over many years, I have acquired items that may interest your collection. I know the above David Glover so I am not sure what material he has sent you other than perhaps the 1972 Antiquarian transaction about the family history. Do you have photographs of Evan Sutherland Walker's parents, George McKay Sutherland and his wife Elizabeth, and his children, particularly William who in 1884 legally dropped the name Walker from the family name? Please left me know if copies of such material would be of interest. I give a one hour presentation about the family's Lightcliffe connections before they went to Skibo. I am looking for Kitty Sutherland-Walker, who married Walter Howard-Tripp, the parents of June, who married John Alan Burns, 4th Baron Inverclyde of Castle Wemyss on 21 March 1929. Kitty, described as a pretty heiress, is also recorded by the name of Ellen Kate Walker and was apparently born in 1872. I am related to George Mackay Sutherland and I have been collating my family history. My Great Grand Mother Mary Haig Guyon lived in skibo Castle which was then sold.